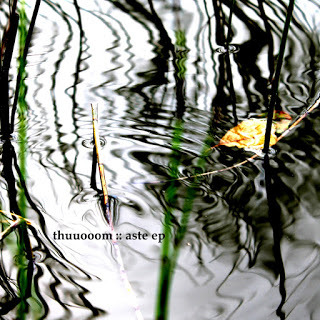 Comment: behind the project Thuuoom is a sonic experimentalist Tuomo from Finland who has been issuing his music since 2008 under his own imprint Textural Healing. In the meantime I was quite worried because of having had no releases by the artist for a while. However, in the recent year he has issued four outings so far. The three-track Aste EP is one of them clocking in at a 28 minute. Technically it is a little bit different than his previous ones because on it he operates with an acoustic guitar and an Elka Consolette organ. Previously Tuomo had been relying on such proper and non-proper instruments as music boxes, plastic bags, wine glasses, acoustic guitars, toy pianos, faucet, elevator, kettles, coin, contact microphone, balalaika, bottles, human voice, midi, whistles, Excel (! ), electric guitars, dices, shelves, tables etc. Later on, of course, he mixed them up into solid electronic compositions. Back to the topic again, partly because of that his soundscape is more restrained and buried yet being enough abstract and stimulating at the same time. One has to crank up the volume of his/her volume system to hear exquisite nuances coming out from there. By listening to such sort of music I cannot bypass the comparison with a space rocket flying in a very remote distance from Earth being totally alone and seeming like a very small dot in an immense space while emitting such sort of sound being barely hearable on the outing. First of all, the recent issue is all about the shapes of microscopic waves, which used to drone at different frequencies. At times it is more bass-drenched, at times more demonstrating lighter tones. In fact, it is the most austere and minimal issue I have heard by the artist and because of that I needed more listening times to get related to it in a more close manner. In a sense, it is more mathematics than music, just being a physical representation of sounds. It is not post-psychedelic electronica and forestelektro anymore. On the other side, it is said on the page of the release that these tracks were conceived during the Kaiut Sessions, another issue, but did not fit on the said album. By my opinion, to understand these compositions better it would be better to listen to Kaiut additionally as well.